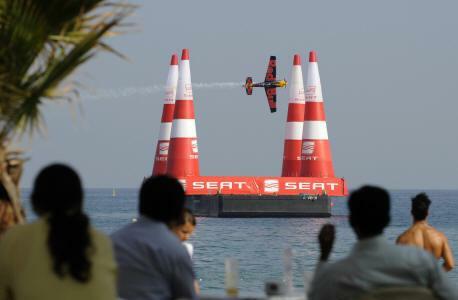 March 11, 2010 - The 2010 Red Bull Air Race World Championship opens in Abu Dhabi on 26/27 March, returning to the United Arab Emirates capital for the sixth consecutive year. The world’s top 15 pilots will start their six-month long battle for championship points in the first of eight races on a total of five continents. Defending champion Paul Bonhomme of Britain and Austria’s Hannes Arch, the 2008 champion will resume their thrilling duel over the sparkling turquoise waters of the Arabian Gulf on Abu Dhabi’s famous Corniche. Arch, who won the 2009 race in Abu Dhabi but finished second overall to Bonhomme, has worked hard on improving his aircraft during the off-season and will be looking to get back in front of his British rival. Abu Dhabi has been a popular fixture on the Red Bull Air Race calendar ever since the World Championship officially began in 2005. The warm temperatures and famous winds which can change direction abruptly during the course of the day make it one of the most challenging tracks and a favourite for the veterans. Loidl said spectators will also have the chance to meet the pilots and see their planes at the race airport located at Municipality Harbour during the Public Pit Lane Walk on Qualifying Day. “We hope fans will take advantage of the chance to meet the pilots and see their incredible planes up close,” Loidl said. The opening round of the Red Bull Air Race World Championship takes place in close partnership with the Abu Dhabi Tourism Authority and under the patronage of HH Sheikh Hazza Bin Zayed Al Nahyan, the President of the Abu Dhabi Sports Council. The picturesque blue skies and dramatic Abu Dhabi shoreline with its towering skyscrapers will provide a spectacular backdrop for the first round of the international motor sports championship which will be one of the Middle East’s most breathtaking sports events of the year. Qualifying takes place on 26 March followed by Race Day on Saturday 27 March. The 2009 championship battle between Britain’s Paul Bonhomme and Austria’s Hannes Arch captivated fans around the world. Bonhomme was crowned champion after winning the finale in Barcelona in front of a record crowd of 800,000. More than 3.5 million spectators followed the action at 6 races and it was watched by 270 million people on television networks around the world.